What can you do about cognitive dysfunction in cats? Cognitive dysfunction in cats, a.k.a. cat or feline dementia, is the result of physical and chemical changes that affect the brain function in cats as they get older. Feline dementia is unfortunately uncurable, but early diagnosis and intervention can really help to delay the progression of the disease. And with the right management it is possible to improve significantly the quality of life for cats with dementia. Treatments for feline dementia usually include prescribed medication as well as SAM-e supplementation. As well as making some dietary and environmental changes and provide physical and mental stimulation. Nutritionally balanced diet is always important for cat’s health. As our pets get older their health deteriorates and as a result their diet requirements can change. Owners of senior cats should always liaise with their Vet before making significant changes to their pets’ diet. Fatty acids and antioxidants like vitamins A, C, and E, are good for cognitive health so make sure your cats diet includes enough of quality fatty acids, vitamins and minerals. Cats with dementia may not want to go out as much as before, or even not at all. It is however important to keep your cat as active as appropriate for his age and physical condition. It is in many ways easier to make sure that dogs get regular appropriate exercise as you can take dogs out for a walk on a lead. This can be more of a challenge with cats, but some cat owners do take their senior cats out for a walk on a lead. You may want to consider that if your dog is anxious of going out on his own. It is also important to remember that physical exercise is not enough, mental stimulation is as important. Try to encourage your cat to play and be creative in looking for ways to offer adequate mental stimulation for your cat. Cat dementia affects your cat’s social ability. Previously friendly cats can become tense, anxious, and even plain aggressive. Therefore, you may want to supervise your cat’s social interaction with both people and other animals. For this reason, this is usually not a good time to introduce a new pet to the household as it may add to the stress for your already confused cat. Keeping you cat with dementia physically healthy will help to ease his stress and discomfort. It is therefore good to visit the Vet more frequently for health check-ups. Not only will it help you to follow better the progression of your cat’s dementia, it will also help you to detect any health issues early on. There are some prescribed medications available for cats with cognitive dysfunction. They will not cure you cats condition, but medication can help to manage, and even slow down the degeneration, of the disease. The best know prescribed medication for feline dementia is Selegiline hydrochloride (best known brand names are Anipryl in the US and Selgian in UK). Selegiline enhances the amount of chemicals within the brain that act as messengers between individual nerve cells and prolongs the activity of your cat's remaining dopamine. 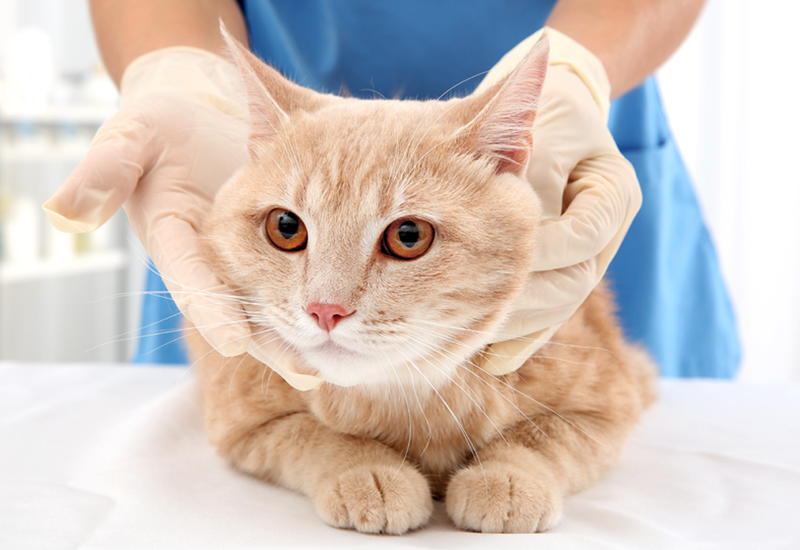 Propentofylline is another commonly prescribed medication for cognitive dysfunction in cats. It increases the blood flow to the brain and has been shown to improve the cat's energy levels and concentration. SAM-e is made naturally in the body and plays an important role in normal bodily function. Studies have shown that the concentration of SAM-e in the body, including the brain, degenerates with age. Supplementation is required to increase the level of SAM-e in the body as there is no food source of SAM-e available. SAM-e supplement for cats has been shown to be safe and effective way to support cognitive dysfunction in cats. SAM-e helps to increase the dopamine function in the brain, stimulates the brain function and works as an antioxidant. 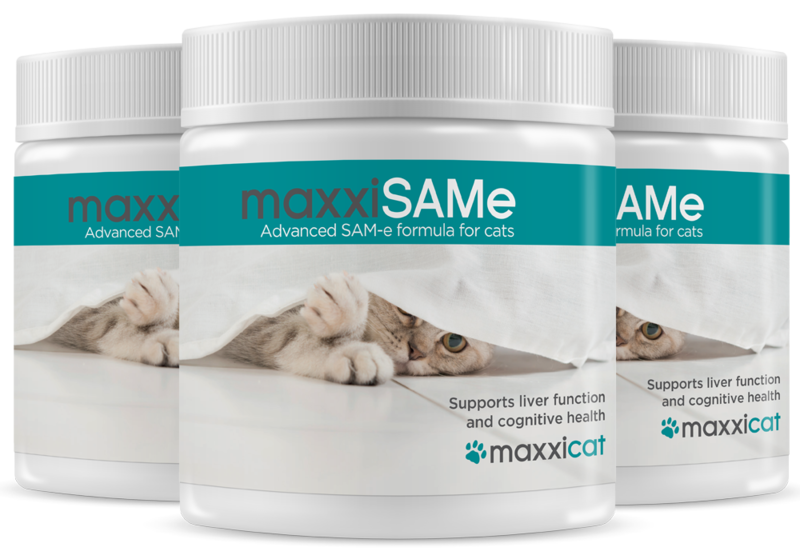 maxxiSAMe is an advanced SAM-e formula for cats that has been used successfully for cats suffering from cognitive dysfunction, or dementia.